Exultate Domino : Psalm 100 / music by Nigel Butterley. CD: Sydney Chamber Choir & Kampin Laulu Chamber Choir, Finland. 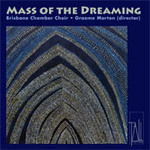 CD: Mass of the Dreaming / Brisbane Chamber Choir, Graeme Morton (director).